The custom imprinted Colter Metallic Metal Stylus Twist Action Ballpoint Pen is one of the most up-and-coming promotional products in the industry. A classy slim style Twist Action Stylus opposite rubberized stylus includes a standard ballpoint ink cartridge for writing on most surfaces. The stylus is compatible with all of today's tablets & smartphones. 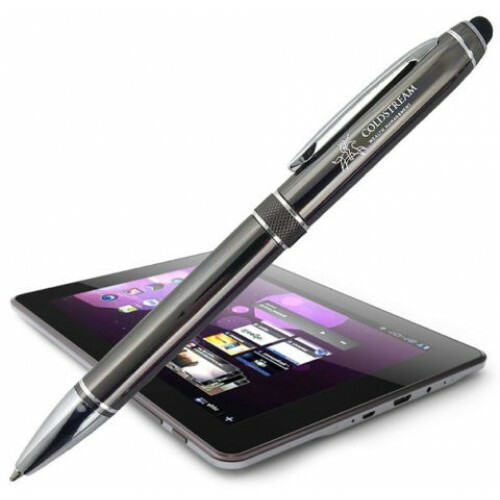 This metal/stylus pen comes with 3 lines of Laser engraving free! Laser Engraved. One Color Imprint Only. You will be on the cutting edge of promotional giveaways with the Colter metallic ballpoint pen with metal stylus and twist action. 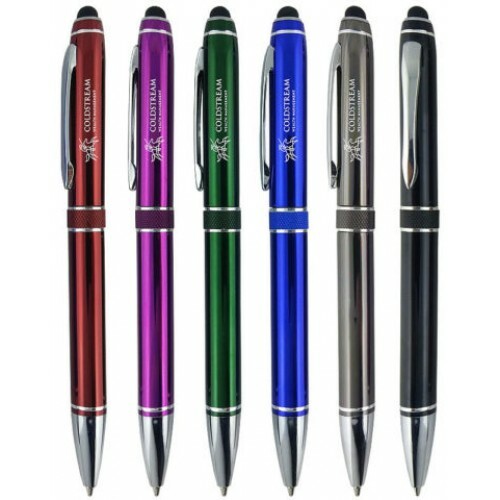 The metallic twist-action pen will be the item everyone is clamoring for at the tradeshow or conference. It will become the prized pen at many desks with its smooth writing and medium-point black ink. The design features a slim style twist action stylus opposite rubberized stylus. The Colter metallic ballpoint pen includes a standard ballpoint ink cartridge that can be used on most surfaces. The stylus also is perfectly compatible with all of the latest tablets and smartphones. It also is a perfect way to display your company name or logo, getting it into the hands of hundreds of people. This Colter metallic ballpoint pen with metal stylus and twist action is offered with three lines of laser engraving. It is a single-color imprint. There is an additional imprint color setup fee. The imprint area is 1 ½ inch by 5/16 inch. 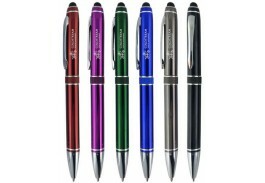 The metallic ballpoint pen barrel is available in black, blue, green, gunmetal, purple or red. All of these pens come with silver trim. The pen is perfect for keeping notes at a conference, then taking it home to use for all of your writing. The clip is durable. You can carry this pen safely and securely in your pocket. Ordering is a breeze. Visit the Promotional Pen Store website to view our online catalogue and list of fonts. Our website is safe and secure and we offer a low price guarantee. You can shop and order without worry. We also offer free domestic ground shipping options on this pen. For one free proof, mail artwork and any instructions to info@promowebstores.com. We also have a toll-free number you can call with any additional questions. You can reach us at 800-974-3611.